Ray Trevor Passon, pictured in the 1944 Bay Blue Book. I had great, positive feedback from Eleanor Seitz McIlvied’s Columbia Road memories. 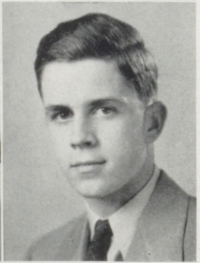 I heard about how you love to read about life “back in the day.” Here is another story of growing up in the village and attending Parkview School by Ray Trevor Passon, class of 1944. Enjoy! Our family moved to Bay Village from the “big city” in 1939. My parents bought their first home near the east end of Oakland Road. It was new, cost about $6,000, and had a half-acre of woods stretching back to the railroad tracks. (The Old Nickel Plate RR flattened a few pennies for me, too.) I had a pretty long walk to the seventh-grade at Parkview High; my brother David, a much shorter walk to Forestview School. There was a pond over near Clague Road and the tracks where I caught sunfish in the summer and ice-skated in the winter. Today it’s somewhere under Interstate 90. Bay turned out to be a wonderful place to grow up. The old high school cinder track; I have a scarred knee to prove it. Coach Shollenberger, who said “Sam Hill” when he was mad and “Sugar” when he was real mad! He left for the Navy service early in 1943. Smoking in the ravine (not me, of course). A practice blackout during a basketball game (Oh my! What went on there?). Mr. Schumacher, the math teacher (and one of my favorites), who could fling a mean piece of chalk. Then there was Miss Paspek’s typing class where we faithfully chanted and pounded out the home row: a-s-i-d-k-f-j-g-h” to the beat of her ruler on the desk. I owe my currant prowess on the computer keyboard to those days in her class. And our new English teacher, Miss Konkana, who was young, blond and attractive. She seemed almost our age. I’m afraid we didn’t give her the same respect we showed for the likes of Miss Sebert or Miss Bortz. Setting our own pins at Campana’s bowling alley just across the tracks in Dover. Helping Bill Strauss deliver ice to the cottages along the lake in Serb’s Model T truck. The day we ditched to go downtown to the Hippodrome Theater. If my memory serves correctly, we saw two showings of the movie “Blues in the Night” and three live sessions of the Glenn Miller Orchestra. And finally, our country was at war during most of our time in high school. We had fun times but underlying it was the seriousness of supporting the war effort in any way we could. Several classmates left for the military before graduation. Probably my last memory of those days was the boys of the class of 1944 looking forward, not to college or a job, but to which branch of the armed services to join or to be drafted, and to become men. Ol’ jolly Sholly was sick in bed. You’ve got to have FIGHT!